"I can&apos;t believe that girl!!! Here I am trying to understand her and there she goes ignoring me like nothing happened!! UGGHHH!!" Was what Anchan wanted to say but couldn&apos;t. She was mad. Reaaallllyy mad. Mad at Shuka but even more mad at herself. But despite the anger she couldn&apos;t bring herself to say those words to Shuka. It&apos;s been 3 days, 3 damned days since their fight started. She didn&apos;t really know what started that fight in the first place! At first it was all fine, nothing to worry about. She was being her usual supportive self that day, supporting her one and only Saito Shuka with her photoshoot with a girl named Yuki who Shuka introduced as a friend of hers, even if it was absolutely against her entire being to let her do so but then again, Anchan didn&apos;t want to sound so possessive so she let her do it, watching only at the side despite the anger caused by jealousy building up inside her with every shot they took. Anchan was being reasonable and understanding, she knew that Yuki carrying Shuka bridal style is part of the shoot, she knew that Yuki hugging Shuka is also part of the shoot, she also knew that Shuka lying down on Yuki&apos;s leg is part of that damned shoot. Yep, Anchan wasn&apos;t angry (She&apos;s super angry) she wasn&apos;t really. Everything is fine. That was what she told herself that day but then on the way home Shuka was unusually quiet. That was all she could remember before everything went south. She wanted to talk to Shuka but the said girl was trying (and succeeded) to avoid her every time she gets. This day was no better, she only saw Shuka at times where she can&apos;t go near or talk to her because they were in the middle of a livestream or recording. Letting a deep and heavy sigh escape her lips, Anchan walked out of the studio, only to find a familiar looking girl that seemed to be waiting for someone outside. "Oh, you were at the shoot! Shuka&apos;s friend!" The girl exclaimed. That last part irked Anju to the highest but she tried her hardest not to show it. "Oh, that&apos;s good. You guys have fun" before turning around and leaving with a frown. Anchan was more than determined to talk to Shuka after morning came. She doesn&apos;t want this anymore. She didn&apos;t want this. What could she have done wrong for Shuka to torture her like this? She wanted answers, a lot of answers, so what she did was, after their livestream she grabbed Shuka right away and went to some place where they can be alone. "Shuka, please. Talk to me" Anchan pleaded, taking Shuka hands in hers. Surprisingly Shuka didn&apos;t resist but she kept her head down and her gaze on her feet. "Shuka please just please. I can&apos;t stand this. I can&apos;t stand you not talking to me. I can&apos;t stand you being mad at me without me knowing the reason why" Anchan gripped Shuka&apos;s hands tighter. "You....." Shuka muttered but still averting her gaze. "What? Shuka you know I care, I care about you more than anyone else. I did care and I still care, I will always care about you. What makes you say that?!" Anchan couldn&apos;t hold back anymore. Not anymore. "Yuki said otherwise" Shuka said nothing more than a whisper but not silent enough for Anchan not to hear but despite this she let Shuka continue. "She.....told me...that on our photoshoot...you left because you had to go and see Rikyako..." Shuka said now on the verge of crying. Anchan, noticing this, wrapped Shuka in a hug. Now that Anchan thinks about it, she did leave that day because she Rikyako called her to check if Anchan was available because if she was she&apos;d ask Anchan to come and check on a few things but she declined the offer because of course, her girlfriend needs her. "You idiot" Anchan muttered on Shuka&apos;s head while still hugging her. "I did leave. But that was because Rikyako called me. I never went to see her, she called me and asked if I was available but I said I wasn&apos;t because I have to support you on your shoot" Shuka hugged Anchan tighter but Anchan released her and caressed her cheek with a smile. Shuka, about to open her mouth to say something got cut off by Anchan&apos;s pair of lips meeting hers. Shuka immediately returned it. After a while, they both parted because of lack of air. "She called me your friend yesterday. 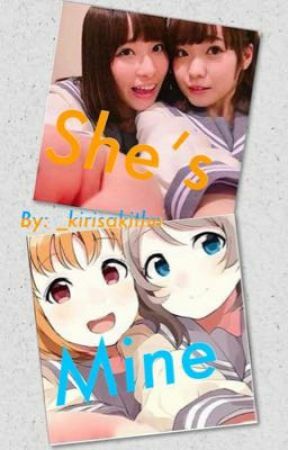 I think it&apos;s time you tell her who I really am to you" Anchan said, Shuka leaning closer. "As much as how amazing that title sounds, no. Im yours Shuka" Anchan gave her a peck on the lips. "That&apos;s what I absolutely love about you Inami Anju" Shuka said before kissing Anchan again, hands around Anchan&apos;s neck and Anchan&apos;s hands around Shuka&apos;s waist.